Thermal Imager Camera Provides the capability to help detect subte problems during fix the broken motherboard. in Phone repair industry, it is hard to find the Minor symptoms, if not identified timely, it maybe lead to the motherboard fixing failure or broken the mobile phone. All of these cases, the Thermal Imager Camera can speed up the diagnosis cell phone PCB problems, reduce even avoid the unscheduled downtime, and minimize damage to structures and contents. Infrared thermography offers a variety of advantages. that's why Why use Thermal Imager Camera in Phone repair industry Increased safety. the Technicans can usually inspect without directly contacting equipment. Successful commissioning of new installations. Whether installing a new motor-control center, electrical service, roof, steam line, HVAC system or building insulation, infrared thermography can be used to document the condition at the time of acceptance. This baseline documentation can be used to verify manufacturer performance speciﬁcations or provide a basis for comparison at a later time. A thermal image can also indicate potential faults in installation, so that if a problem is found it can be immediately corrected or monitored until a repair can be scheduled. Improved production rate and quality. Using infrared thermography for preventive or predictive maintenance can help to minimize equipment malfunctions and failures and maintain optimum production efﬁciency and safety. Today, we will talk about Infrared Thermal Imaging Analyzer Mainboard Maintenance Fault Diagnosis Instrument For Mobile Phone Repair. which is the world's first to use dual-spectral interleaved positioning technology. 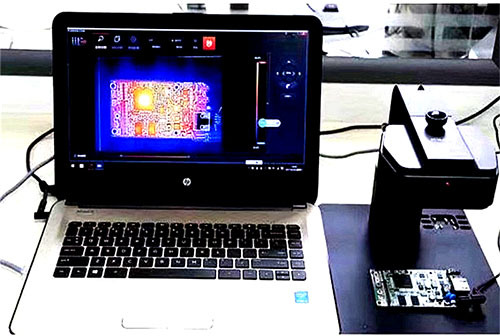 Through powerful PC-side intelligent analysis software, the use of intelligent algorithms, it can detect the motherboard chip operating temperature by the use of intelligent technology. By the normal / abnormal motherboard comparison analysis, it can quickly and accurately identify problem chip, which can assist maintenance personnel in overhauling the problem board, greatly improve the efficiency and maintenance accuracy. If you need other phone repair informations, please do contact with nandrepair customer service centre.